If you allow brake dust to sit on your wheels for a prolonged period of time, it can eat into the coating (if there is one) and pit the metal. Brake dust is made of an adhesive and carbon fibers that come off the brake pad and tiny metal shavings from the rotor. The intense heat and friction generated by the wheels makes this mixture highly corrosive. Because you probably drive every day, more brake dust is constantly being made. Frequent cleaning is the only way to keep your wheels safe. A good start is the Pinnacle Concours Wheel and Tire Kit! Check out our Tire & Wheel Care Page for more excellent tire and wheel products. When you wash your vehicle, clean the wheels and tires first. This will prevent overspray or grime from splashing onto already-clean panels. If you like to clean your wheels and tires with soap and water, use a separate wash and rinse bucket and soft bristle brush. Choose a cleaner that is appropriate for the type of wheels you have. Roughcast aluminum and chrome can withstand stronger cleaners than coated, painted, or anodized wheels. The cleaner will say what it is suited for on the label. For example, Mother’s Foaming Wheel & Tire Cleaner can be used on any type of coated wheel, but their Chrome/Wire Wheel Cleaner is not safe for coated wheels. If you are not sure what kind of wheels you have, use a cleaner that is safe for all wheels. I prefer to use a cleaner that works on the tires, too. Wolfgang Tire & Wheel Cleaner is a gel formula that clings to both the tire and the wheel surface to penetrate below the surface. It loosens brake dust that has crept into tiny holes in the metal and into the pores of the rubber. A little agitation with a brush will allow Wolfgang to work even better. If the wheels have brake dust that's caked-on, or if they haven't been cleaned in months or years, consider a more powerful wheel cleaner. 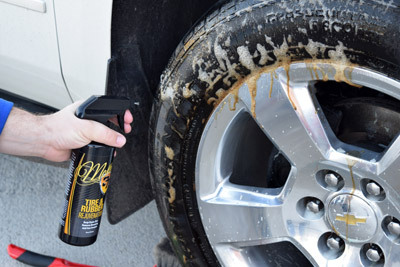 Pinnacle Advanced Wheel Cleaner Concentrate is a professional grade wheel cleaner that forgoes caustic acids, butyl ethers, and other harsh detergents that do more harm than good. Pinnacle Advanced Wheel Cleaner Concentrate changes colors as it dissolves brake dust and the concentrated formula can be diluted up to 1:3 with water for maintenance cleaning. Brown tires are all too common, especially when caustic degreasers have been used to clean them in the past, or if they've never been protected with a tire gel. McKee's 37 Tire & Rubber Rejuvenator removes browning and grease from tires, leaving them with a dark black finish. You see, tires contain antiozonants, rubber conditioners, and UV absorbers that help keep the tire flexible. The wrong cleaner will actually cause the antiozonants, rubber conditioners, and UV absorbers to leach out of the tire, resulting in browning, discoloration and cracking of the tire. McKee's 37 Tire & Rubber Rejuvenator is non-caustic, non-acidic, and it will not harm your tires! You’d be surprised how many tire and wheel brushes are out there. Basically, you want to look for a brush with feathered bristles for the wheels. This will prevent scratching. The Montana Original Boar's Hair Wheel Brush is a great option. For tires, use Mother's Contoured Tire Brush. Tires require a stiffer brush to really scrub the rubber. Don’t be afraid to put a little elbow grease into it, particularly if your tires have layers of old dressings on them. These layers will turn brown and make your tires look worn out if you don’t scrub them off. If you have a vehicle with low-profile tires, the Low Profile Tire Brush will quickly become your go-to tire cleaning brush! The Low Profile Tire Brush features hundreds of stiff nylon bristles that get into the nooks and crannies of your tire’s sidewall, removing stubborn road film and previously applied tire protectants. The curved handle minimizes fatigue on your hand while enabling maximum scrubbing power. Always clean your tires and wheels one set at a time to prevent the cleaner from drying. Wash and then rinse with a strong jet of water before moving to the next tire. Don’t forget to dry your wheels! Use a Microfiber All Purpose & Wheel Detailing Towel or a terry cloth towel, but not one that you plan to use on any other part of your vehicle. Once a towel is used on the tires or wheels, it should always be used for tires and wheels. Drying prevents water spots and helps you remove every last bit of the brake dust. Another option is to coat your wheels. Pinnacle Black Label Diamond Wheel Coating blankets your wheels in a rock-hard barrier of protection that is impenetrable by ferrous brake-dust particles, road salt, tar or oil. Designed with brake-dust laden sports cars in mind, Diamond Wheel Coating and the layer of protection it creates makes laborious wheel cleaning a thing of the past. The super slick surface virtually eliminates brake-dust build up. Spray and wipe application lasts up to 18 months! 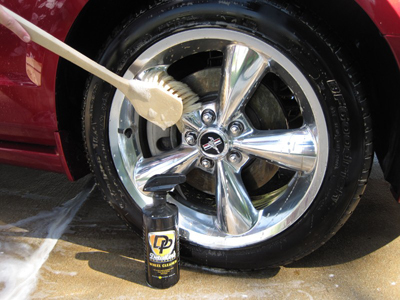 Thoroughly clean each wheel first using Pinnacle Advanced Wheel Cleaner Concentrate. Choose your tire dressing carefully. Old formulas contain silicone, which produces a glossy shine but it turns brown over time. These dressings deplete the rubber’s own protectants faster, causing it to age prematurely. Newer formulas, like Pinnacle Black Onyx Tire Gel or Optimum Opti-Bond Tire Gel, are water-based and less shiny. They create the look of new tires with a semi-gloss sheen that doesn’t turn brown. Pinnacle Black Onyx Tire Gel also nourishes the rubber to recreate the look of new tires. You can often layer water-based dressings to get a glossier shine. Follow the directions on the label carefully. Always apply thin coats and allow drying time before you drive your vehicle. Even the best dressing will sling off if it’s on too thick or it doesn’t have time to dry. Another option is to use a tire coating, like McKee's 37 Tire Coating or Tuf Shine Tire Clear Coat. These two products are semi-permanent, with an edge going to McKee's 37 for overall ease of use. McKee's 37 Tire Coating is an acrylic-based resin that forms a flexible, chemical-resistant coating on your tires. Engineered to outlast and outperform conventional oil and water-based tire dressings, McKee's 37 Tire Coating will not wash or sling off and will not turn tires brown. A single application of McKee's 37 Tire Coating will provide several months of protection, even in extreme climates. McKee's 37 Tire Coating dries to the touch – it even passes the “white glove” test! McKee's 37 Tire Coating also does wonders for whitewalls and raised white lettering! If you have a classic car or a lifted four wheel drive pickup truck, McKee's 37 Tire Coating will keep your whitewalls or raised white lettering bright and white for several months. Tire coatings are a little more involving in their application, so make sure you purchase the McKee's 37 Tire Coating Kit to ensure you have everything you need for proper application. Another benefit of the kit is you save money! Dressings provide UV protection and prevent drying, cracking and fading. 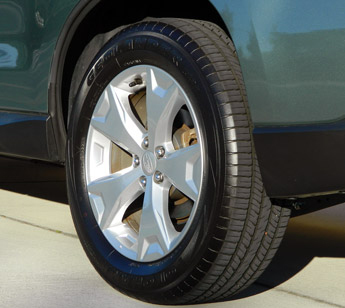 With a little TLC, your vehicle’s wheels and tires will look as sharp as the rest of your ride! See our Metal Polishing Guide for details on wheel polishing.